I first came across this book in my studies at the University of Warwick in a class called Social and Political Movements taught by Professor Jim Beckford. Jim was a great tutor and a really nice guy to boot, his classes were always looked forward to although his rigorous analysis of ideas may upset some of today’s precious petals. 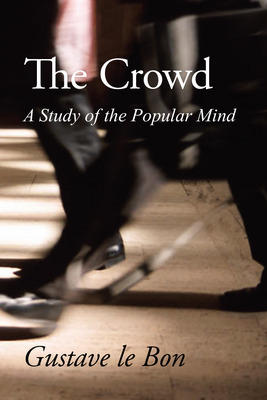 The first class looked at the work of Le Bon and his study of the psychological nature of crowds. I remember liking it at the time but feeling that it was just too much guess work and overtly influenced by the authors experience of a turbulent and frightening period of French history. That was back in September 1990, much water has passed under the bridge since then, so why come back to it now? Well it all comes back to a conversation with Rory early in 2015 about ConCom and the triune brain and I mentioned Le Bon and his theory. The simple analysis is that once subsumed in a crowd an individual surrenders their individuality and a psychological mind is formed through contagion, emotions spread throughout the crowd and freed from individual responsibility the baser instincts take over. The individual ceases to think about the consequences of their actions as emotions take over and acts of both barbarity and heroism are possible. Le Bon describes the ‘spinal cord’ as being in control and not the intellectually reasoning brain. Ring any bells? Well it rang mine. The thing is in the PC days of the 90’s this became a bit of an Aunt Sally, by the students that is, to be fair Jim used it in its historical context to begin a much wider and deeper exploration of the subject at hand. For the students, fresh out of some of the top schools in the UK, it was to be belittled, corny, out of date, lacking in evidence etc. I was 31, I had been involved in a lot of crowd violence involving a full on riot with flaming barriers, thousands of people mobilised and hand to hand fighting with specially trained units of riot police, plus the occasional football riot, I thought differently. Though written in a voice from a different age and though the criticisms raised were in part valid, it was not enough to write it off as a whole, I thought all along there was something of value here, by its presence on his curriculum so did Prof Beckford (nice man but a Spurs fan, sigh). In his book ‘The Righteous Mind, Jonathan Haidt revives the work of several theorists who were also sacrificed at the stake of political correctness and shows how resulting evidence almost conclusively provides the evidence they lacked which allowed the ‘PC mob to grab their pitchforks and light their torches. I am not claiming that much for Le Bon but he sure saw something the others did not want to see. There is another parallel I want to draw with Haidt’s work that also prompted me to go back to Le Bon, Le Bon was here first and Haidt never heard of him, or if he did he never recognised him. Maybe because Le Bon was last in some pseudo academic backwater is what I would think, forgotten and unloved. However, I suggest you go get your free copy from Kindle now, read it, read it in the full and tell me that it does not describe how the world is today. As I reread it I saw all the arguments, and candidates, in the forthcoming presidential election in the USA, it frames the rise of Islamic State, I will not prime you too much but this is a really interesting read. There are bits that lack intellectual rigour, it is more polemic than analysis and his biases are obvious, BUT, that is not a reason to ignore it. Go get a copy and I hope you enjoy it as much as I did.